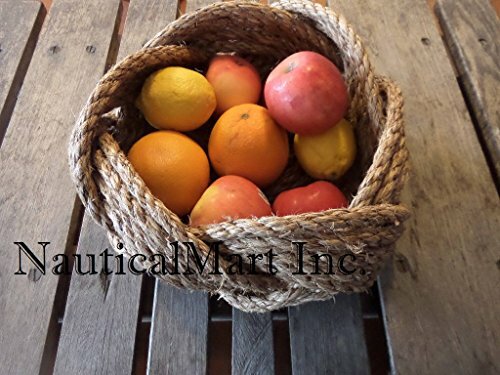 This beautifully hand made Rope basket is our new creation and added to our catalogue.Great decor and Multi Purpose basket for dining hall, kitchen, living room, bed side table and on top of your fridge.use as a centerpiece or a fruit basket or bread bowl. The size is approximately 10 inches diameter x 5 nches high. No two items the same make for a very unique item as all these are handmade. Please contact me for specific sizes or quantities if you are interested and I will see if I can make it happen. Love to do custom orders so please don't hesitate to contact us. Please also don't hesitate to drop me a line if you are looking for a wholesale account with us as or interested in a bulk buying for a discount. Custom size/design Bowl can order to NAUTICALMART INC.